As legend has it, in 1820 the Danish physicist Hans Christian Ørsted was giving a lecture demonstration of various electrical and magnetic effects. Suddenly, much to his surprise, he noticed that the needle of a compass he was holding was deflected when he moved it close to a current carrying wire. Up until then, magnetism has been thought of as solely a property of some rather unusual rocks called loadstones. Word of this discovery spread quickly along the scientific grapevine, and the French physicist Andre Marie Ampère immediately decided to investigate further. Ampère's apparatus consisted (essentially) of a long straight wire carrying an electric current current . Ampère quickly discovered that the needle of a small compass maps out a series of concentric circular loops in the plane perpendicular to a current carrying wire (see Fig. 28). The direction of circulation around these magnetic loops is conventionally taken to be the direction in which the North pole of the compass needle points. Using this convention, the circulation of the loops is given by a right-hand rule: if the thumb of the right-hand points along the direction of the current then the fingers of the right-hand circulate in the same sense as the magnetic loops. Ampère's next series of experiments involved bringing a short test wire, carrying a current , close to the original wire, and investigating the force exerted on the test wire (see Fig. 29). This experiment is not quite as clear cut as Coulomb's experiment because, unlike electric charges, electric currents cannot exist as point entities--they have to flow in complete circuits. We must imagine that the circuit which connects with the central wire is sufficiently far away that it has no appreciable influence on the outcome of the experiment. The circuit which connects with the test wire is more problematic. Fortunately, if the feed wires are twisted around each other, as indicated in Fig. 29, then they effectively cancel one another out, and also do not influence the outcome of the experiment. Ampère discovered that the force exerted on the test wire is directly proportional to its length. He also made the following observations. If the current in the test wire (i.e., the test current) flows parallel to the current in the central wire then the two wires attract one another. If the current in the test wire is reversed then the two wires repel one another. 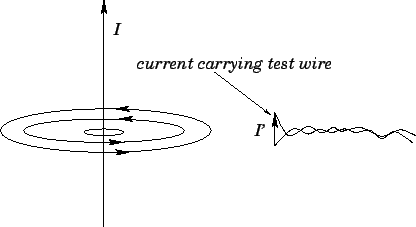 If the test current points radially towards the central wire (and the current in the central wire flows upwards) then the test wire is subject to a downwards force. If the test current is reversed then the force is upwards. If the test current is rotated in a single plane, so that it starts parallel to the central current and ends up pointing radially towards it, then the force on the test wire is of constant magnitude, and is always at right-angles to the test current. If the test current is parallel to a magnetic loop then there is no force exerted on the test wire. If the test current is rotated in a single plane, so that it starts parallel to the central current and ends up pointing along a magnetic loop, then the magnitude of the force on the test wire attenuates like (where is the angle the current is turned through-- corresponds to the case where the test current is parallel to the central current), and its direction is again always at right-angles to the test current. Finally, Ampère was able to establish that the attractive force between two parallel current carrying wires is proportional to the product of the two currents, and falls off like the inverse of the perpendicular distance between the wires. 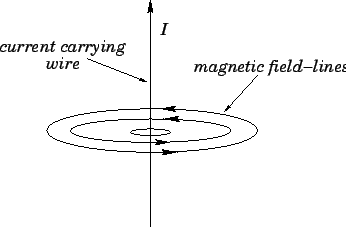 The concept of a magnetic field allows the calculation of the force on a test wire to be conveniently split into two parts. In the first part, we calculate the magnetic field generated by the current flowing in the central wire. This field circulates in the plane normal to the wire: its magnitude is proportional to the central current, and inversely proportional to the perpendicular distance from the wire. In the second part, we use Eq. (229) to calculate the force per unit length acting on a short current carrying wire located in the magnetic field generated by the central current. This force is perpendicular to both the magnetic field and the direction of the test current. Note that, at this stage, we have no reason to suppose that the magnetic field has any real physical existence. It is introduced merely to facilitate the calculation of the force exerted on the test wire by the central wire.